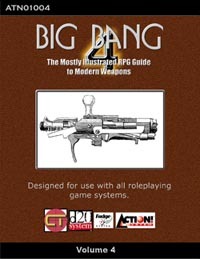 Another short themed volume of Big Bang: The Mostly Illustrated RPG Guide to Modern Weapons. This particular volume revolves around a document published in 1889, Small Arms of the European Armies. This volume looks back at the start of the era of modern firearms, detailing a number of weapons used around the world between 1870 and 1890. Included is a copy of the public domain 1889 article, which will provides valuable insight into the struggle of small arms advancement in the military. Of special interest is the many arguments against obtaining more modern weapons; arguments that still stood when the U.S. adopted the M16 in the 1960’s and with the full-auto vs. 3-round burst debates of the 1980’s. Weapons covered include the various Hotchkiss Rifles, Jarmann Rifles, Krag-Jorgensen Rifles, Kroptschek Rifles, Lebel Rifles, Lee-Metford Rifles, Remington-Keene Rifles, Vetterli Rifles, and Vitali Rifles, over 50 different firearms in all. An excellent selection of weapons for those running games in the atmosphere of revolution that swept through post-Napoleonic Europe. Many were serving as military issue weapons as late as World War I.